Sail Chaorainn lies to the Loch Cluanie and is the northerly neighbour of Sgurr nan Conbhairean. The summit ridge lies between the cliffs of Coire Mheadhoin to the E and steep craggy slopes overlooking Gleann na Cicheto the W.
N of the summit a narrow winding ridge leads to Tigh Mor na Seilge (929m) from where a descent into Gleann na Ciche is possible. 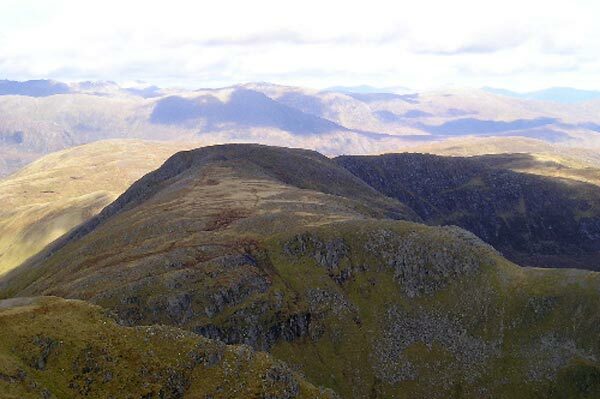 To the S lies a small plateau leading to two narrow ridges, a SSW ridge connecting to Sgurr nan Conbhairean, and a very narrow ESE ridge to Carn a Mhadaidh-ruaidh from where a descent via An Reithe (845m) can be made into Coire Dho. 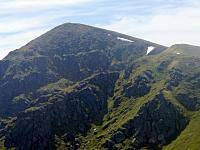 This mountain is normally climbed with Sgurr nan Conbhairean from Strath Cluanie. 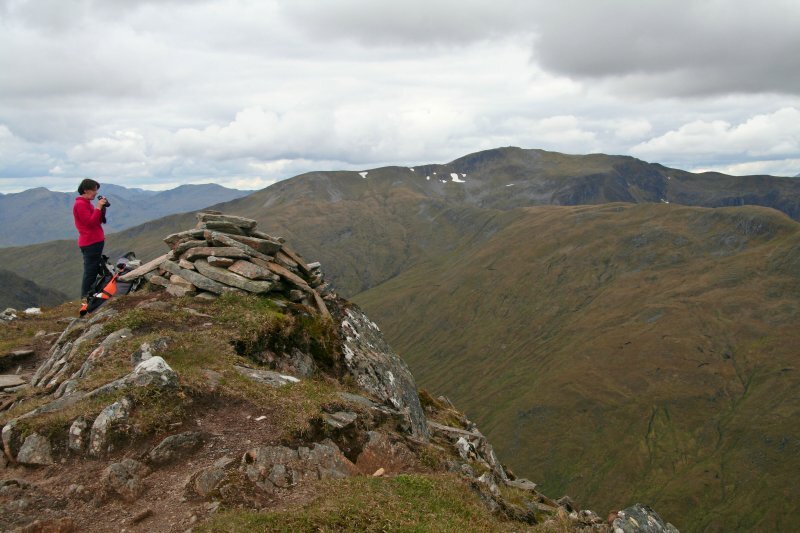 Sail Chaorrain when seen from the summit of Sgurr nan Conbhairean. Walking northwards to Sail Chaorainn, with An Socach and the high Glen Affric hills prominent in the backgrouds. 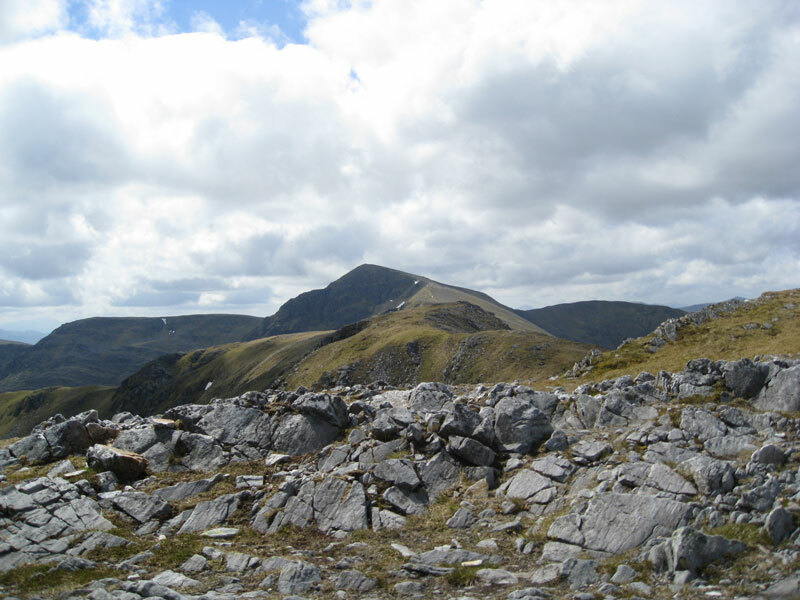 The summary information of one or more ascent routes that include Sail Chaorainn. 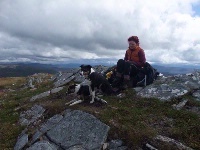 Sarah from Lancashire, whom I met on the hill, with Toto and Spud 7 August 2012. Sail Chaorainn the scene of a 100th celebration, with A'Chralaig and Mullach Fraoch Coire in the background. At the summit cairn of Carn Ghluasaid with the low cloud rising rapidly but not yet quite clear of Sgurr nan Conbhairean in the background. 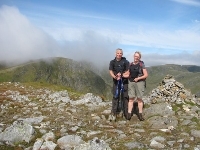 Post a few words about Sail Chaorainn or read what others have had to say.